In the past, epic interpretations of the Bible like “The Passion of the Christ” or “Noah” have sought box office success on the weekend of Palm Sunday. These films are costly and often met with a divisive eye, both within Christianity and outside depending on the audience they want to reach. “Mary Magdalene” is both equally familiar from the films that retell about Jesus crucifixion, yet vastly different in its delivery. Long has the mysterious woman been a minor supporting player in the story, now we view the events through her eyes. From the director of “Lion”, Garth Davis takes a quiet and meandering look into the controversial character. Both Mara (“Carol”) and Phoenix (“Walk the Line”) deliver meditative performances as the narrative casually moves toward the inevitable recreation we have seen played out our entire lives. The family of Mary Magdalene (Mara) are unhappy at her rejection of a prearranged marriage. Her rebel like behavior, attending prayer alongside the men at unscheduled hours, prompt the local sea village to take drastic measures. “There is something unnatural inside you,” accuse the men whose self-proclaimed laws on worship she defies. Word of a rabbi with a great following reaches Mary and after a visit from the man named Jesus (Phoenix), she finds purpose and cause, leaving her family behind to follow the one they call Messiah. Mary would be the only female in the company of apostles and teachers. Told to keep quiet by Peter (Ejiofor), Mary and Jesus become close as she seems to understand his sadness and cryptic instructions about the future kingdom more so than any man who walks behind him. Similarly to Davis Oscar nominated film “Lion”, “Mary Magdalene” relies heavily on visual and cinematic ques to convey emotion. This ethereal film opens with breathtaking location shots of Italy, as it dubs for Judea in 33CE. Similarly to Davis Oscar nominated film “Lion”, “Mary Magdalene” relies heavily on visual and cinematic ques to convey emotion. Reteaming with “Lion” cinematographer Greig Fraser, (currently shooting the upcoming Dune reboot), he literally breathes life into the story with his expert camera work. Only a few times do the special effects of recreated locations like a shot of Jerusalem in the distance, jar the audience from the quaint, isolated roads and camps much of the film dwells. “Mary Magdalene” also has the sad distinction of being the final original score composed by Oscar nominee Jóhann Jóhannsson who died before the films completion. It’s one of his most unique and haunting creations, more present than even dialogue. Most of the film is spoken in a whisper, challenging the viewer to understand the dialogue and not to be lulled to sleep by it’s natural calming effect. This film more than most on the subject, deals with skepticism of Jesus message. How his presence and the spectacle surrounding him appear frantic, cult like and life changing. 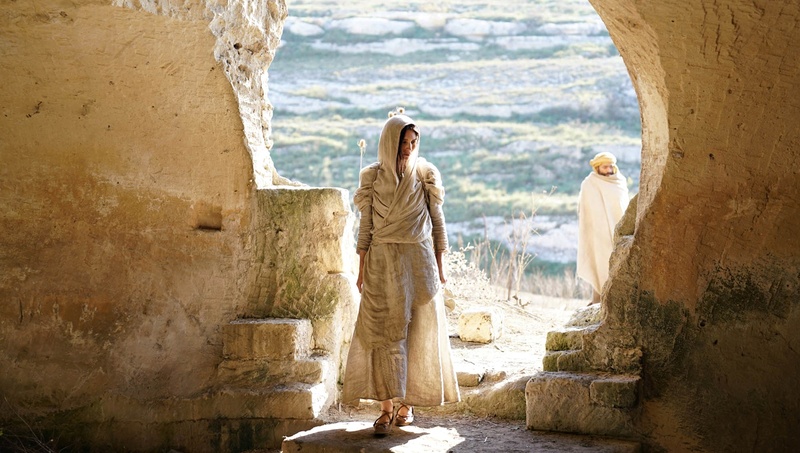 “Mary Magdalene” could easily have been a literal and more liberal interpretation of the events, or as we often see, a generic Bible School catered version of the events. This retelling, which combines what little is known or written about Mary Magdalene with curiosity and mystery, dismissing the controversial notion that Mary was a prostitute or afflicted with demons. Mara and Phoenix excel in emoting internal fear, hope and acceptance. Their eyes do most of the acting to deliver much of the communication and the musical scores does the rest. Shines an intangible light on the controversial Biblical figure, told with striking visual and cinematic ques.